Smoobee Magic "No Cry Brush"
The Smoobee Magic "No Cry Brush" is designed specifically with little kids in mind. This brush was made so there was no more snagging and ripping at the hair so your little ones wouldn't fight you tooth and nail to get away from you when it's time to brush through their hair. Now, I don't have children of my own to test this on but I, myself, have long hair and do know how it is to brush through it once I'm out of the shower and also if I go to sleep with my hair wet and try brushing it in the morning is a pain in the you-who! I also nannied for quite a few years and brushing kids hair was not one of my most pleasant experiences. Especially if the brush is to rough and when you get to the ends of the hair is where it seems to do some damage. So I was excited when given the chance to try the Smoobee brush out! They have 3 cute pastel colors to choose from: turquoise, pink and purple! I obviously as you can see got the turquoise one. The brush has short natural bristles and longer cushion pad bristles. It is also made of solid wood and a good size for those little hands to wrap around the handle. I can tell there is quality and thought put into these brushes just by inspecting it and using it the first time! I have the hardest time getting a brush through my hair when it's wet after towel drying it and also when I go to bed with wet hair and wake up with a wavy rats nest looking hair! So that being the case, that is when I tested out this brush. I towel dried my hair and started at the top working my way down. It easily glided through my hair which surprised me! When I got to the ends where it always gets a little more tangled, I did have to go a little bit harder but there was no pain involved. The bristles they use don't snag on the hair but will untangle it! Which also prevents breakage because your not snapping pieces of hair off when tugging it with the wrong brush! It was even easier to get the brush through my morning hair! If I love this brush as much as I do, a kid would be delighted to have their parents use this instead of one that will tug and pull at their hair and cause pain. Now, I use this instead of my other brushes because of it's ease and less damage to my hair and I loveee that! But I also love that you cab buy little gems to bedazzle your Smoobee!!! Smoobee goes for $23.99 and the gems go for $2.99! You also get free shipping if you purchase two brushes. Also, keep in mind how much more your child would want to use this brush if she decorated it all by herself!! 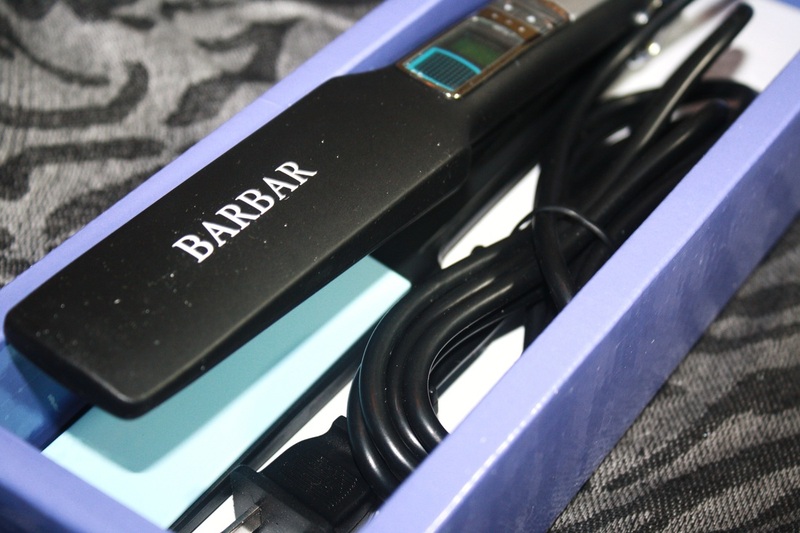 BARBAR Flat Iron (BAR-2500) & GIVEAWAY! 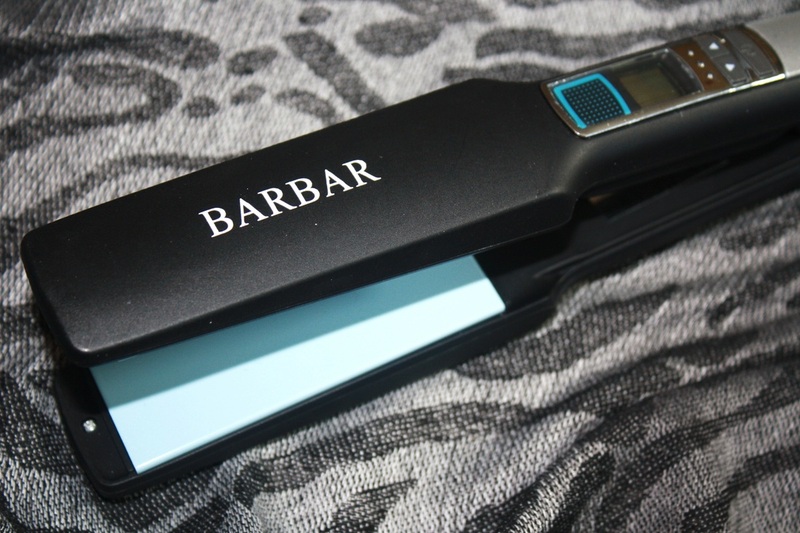 BARBAR 2500 Ceramic-Ionic Flat Iron 1"
I love wearing my hair straight year round. Easy to manage, don't have to deal with gels, mouse or anything like that. It's just that there are SO many choices and brands to pick from and can get really confusing so let me introduce you to a flat iron that BARBAR sent for review consideration..
"With over 20 years of experience as a former stylist, the company's founder, Dominic Barbar, has applied his years of technical know-how to turn his passion into reality by creating a premium line of hair care products that simplify the hair stylist's job." That right there shows that time and effort has been put into all of their products. Not to mention the style! 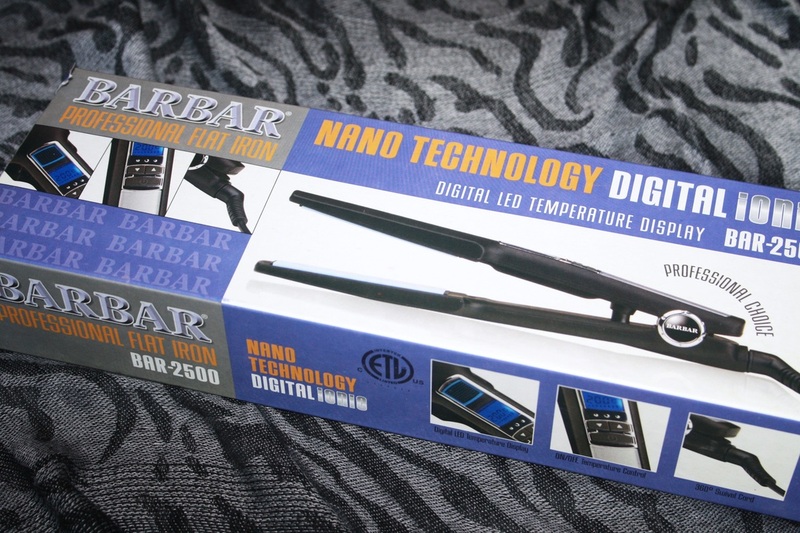 The BARBAR-2500 is a 1" Ceramic-Ionic Flat Iron. It uses nano technology to create soft & shiny results with minimal damage. Also, I love the fact that it has a swivel cord which makes is easier to handle and not get tangled up. It heats up completely in about a minute or so and is ready for use. When I first used this on my sisters super wavy/curly hair I noticed how light it was! This was the lightest flat iron I ever picked up! So if that's a key quality you are looking for in a hair tool, this is a must see! Below are some before and after photos of using this on my sisters hair. I used her as my model because the results are easier to see than with my hair because it is not so wavy. HAIR TOOLS TO AVOID DAMAGING YOUR HAIR. Use a heat protectant to make sure not to damage your hair. This is a before photo of my sisters hair without any product and just naturally air dried. It's wavy and curly and a little frizzy. She loves straightening her hair (I'd kind of call it a little obsession) with making sure it's as straight as possible! So testing this out with her was a great idea. All I did was spray a heat protectant on each section of hair that I did, placed the iron at the top of her hair and slowly pulled down (and repeated a second time to get it as straight as possible). When I did the first run over the hair it made a big difference and made the hair straight but in order to get more of the frizz away I had to go over it a second time. Which to me is no big deal because I do that anyways no matter which iron I am using. I also noticed when gripping the iron I kept pushing the buttons on the top of the tool which accidentally turned the temperature down a little a couple times. Maybe it would be better if the buttons or control was in the inside part of the iron. As an end result you can see it most definitely made her hair straight and added that glossy shine to it. My arm wasn't tired after either because of the almost weightless feel to it. I'm happy I got the chance to do this review because now you have proof that this iron works well and does what it claims. Just a little note: The opinion above is mine. My sister liked it but wish it took a way a little more frizz than it did but then again she is one of those girls who straighten the same section of hair 10 times haha. 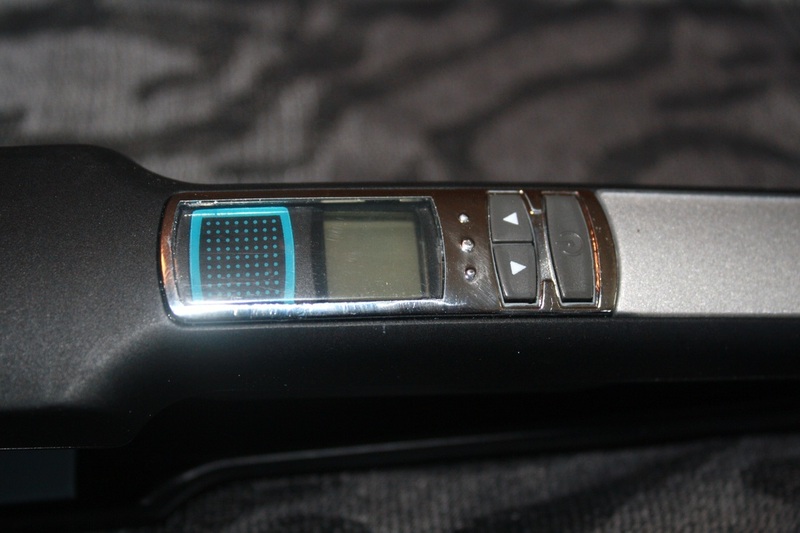 BARBAR-2500 goes for $150 on their website. use the scroll bar on the bottom. I just started getting into curling my hair when I found out about these curling irons that don't have that annoying clip on them. The clip on all the other curling irons I used, seemed to always leave a crease in my hair, or my hair would end up being damaged not from the heat, but from my hair getting caught in the clip. So when the company NuMe decided they would like me to review their curling wand I was super excited to give it a try and share with you the pros and cons. First of, mine is pink. EEEK! They have 4 different sizes to choose from: 13mm,19mm, 25mm and Reverse(tapered). Depending on the barrel size you pick you can choose from pink, black or zebra! How fun! 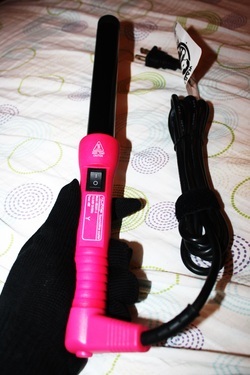 This curling wand goes up to a very hot heat of 410 degrees F (210 degrees C). Very hot, but helps the curl last and works great with hair that never wants to hold a curl! It is tourmaline--infused ceramic wand that also has infrared heat technology which helps protect the hair and smooth it out so there's no messy frizz! And another feature that's a must have with any styling tool is the swivel cord! No messy wire to get in your way! How pretty is that look! My hair turned out to have bouncy playful looking curls, and it took me only about 20 minutes to do this! Yes...I'm not kidding. In your box you will also get the heat protection glove, which reduces the risk of burning your fingers while holding the hair. 3. Take about and inch width of hair and spray it with TRESemme heat tamer spray so I don't fry my hair to a crisp. 4. Hold the wand upside-down and wrap the hair starting from the top near the pink part, all the way around the barrel. 5. They say to hold the hair 2-5 seconds but I hold mine a little longer because my hair is naturally straight and harder to curl. 6. Release the hair and cold the curl in my hand till it cools off a little and spray with hairspray. That's it! then just move to a different section of hair until you have completed your whole head. You can also start midway down your hair for a softer curl look, and not hold it as long to give you some pretty waves. I did manage to burn my neck a little and now I look like I have a nice hickey but it just takes a little practice to get used to. But once you get the hang of it, this tool will make you look like you had your hair done by the salon. Some things that I found when using the curling wand that I wish was a little different was that the "on/off" switch doesn't have heat control. So people with thinner or more fragile hair can't start at a lower heat, it automatically goes right up to 410 degrees. For me this was a plus because like I said my hair is harder to curl and I need the more heat, but for people with more delicate hair may not like that feature. The only other thing I wish the wand had was a little light that lit up when the wand was on so I could see it incase I forgot to shut it off. This product really does it's job and held curls in my STRAIGHT hair all night and I got so many compliments on it because I never wore my hair like this before because it would never stay. I'm super excited about this and hope you will take advantage of this product and discount code (code will be posted soon).
" All NuMe Products are manufactured to the highest standards. Every Curling Wand comes with a one year warranty"
With so many different brands and different gadgets out there for hair styling, how do you know which to choose from!? Let us help!